Sorrel is an alternative term for the chestnut, one of the most common equine coat colors in horses. While the term is usually used only to refer to the copper-red version of chestnut, sometimes it is used generically in place of "chestnut" to refer to any reddish horse with a same-color or lighter mane and tail, ranging from reddish-gold to a deep burgundy or chocolate shade. The term probably comes from the color of the flower spike of the sorrel herb. 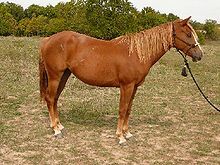 A Quarter Horse registered as "sorrel"
Chestnut is more often used to describe this color in England and on the east coast of the United States, while the term "sorrel" is more common in the Western United States. Some horse enthusiasts insist that chestnut and sorrel are two distinct colorations, but there is no known genetic difference between the two and no clear consensus on what the distinction is. Some argue that "sorrel" should be used to describe only lighter shades, or shades with a very clear reddish tint, while "chestnut" denotes darker shades or shades with more brown in them. The American Quarter Horse Association, which uses both terms, describes a sorrel as a type of copper-red chestnut, but allows that chestnut is also a correct term. In terms of equine coat color genetics there is no difference at all. Solid reddish-brown color is a base color of horses, caused by the recessive "e" gene. Sorrel or chestnut coloration can be distinguished from dun by the fact that a dun horse has a gene that causes slightly washed-out yellowish color, with a darker mane and tail than the rest of its coat, may have areas of darker color on the shoulder and forelegs, and also possesses a narrow, dark line down the middle of the back. A sorrel and a bay, especially a "blood bay," may be confused with one another. However, all bays have "black points" - a black mane, tail and lower legs. Light-colored sorrels, sometimes called "blond sorrels," especially if they have flaxen manes and tails, may resemble a palomino. However, true palomino coloration is the result of a horse's being heterozygous for the cream dilution gene. Some definitions list sorrel as a self color, used to describe only horses whose mane, tail, and legs are the same color as the rest of the coat, with the exception of white markings. Other definitions are broader and include reddish-brown horses with flaxen manes and tails. More often than not, the practical difference is usually not in color, but in usage: horses ridden in the Western tradition are more often referred to as sorrel and horses ridden in the English tradition are chestnut. Many organizations simply avoid the whole fuss and choose one of the two terms to denote all reddish or brown colorations that are not bay. Wikimedia Commons has media related to Chestnut horses.